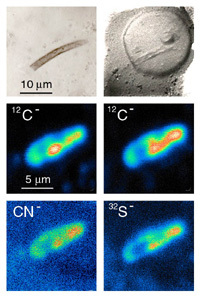 The UCLA SIMS laboratory is partially supported by NSF's Instrumentation and Facilities Program to develop and maintain a national facility for in situ microscale isotopic analyses of geologic materials and to provide access to its unique capabilities to the broader community to address important problems in earth and planetary science. We feature a high spatial resolution, high sensitivity CAMECA ims 1270 ion microprobe as well as a LEO 1230 VP Scanning Electron Microprobe for support. Our facility is the cornerstone of the W.M. Keck Foundation Center for Isotope Geochemistry at UCLA (Dept. Earth and Space Sciences & Institute of Geophysics and Planetary Physics). Since the inception of facility operations (1996), approximately 200 scientists have undertaken projects in the UCLA SIMS lab. Over the last 3 years, more than 100 external users representing more than 50 institutions have used the facility. Most are directly affiliated with NSF-sponsored research project, with about one quarter of remaining users sponsored by other funding agencies (NASA, DoE, NIST, PRF, and NIH). Approximately seventy MS and (mostly) PhD theses have utilized ion microprobe data as a significant component of the research; about half of these students were from institutions other than UCLA.